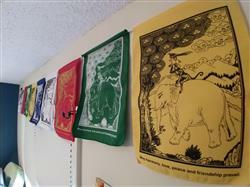 Our set of 10 flags are made of 100% cotton in Nepal. They are hemmed by hand and then screen printed for the best quality art duplication. This traditional 5 color set depicts story of the Four Harmonious Friends along with a prayer written in English, "May harmony, love, peace and friendship prevail." The story of the Four Harmonious Friends illustrates interdependence despite the differences in the size and strength of each animal. It is the epitome of friendship, cooperation, and good relation without considering hierarchy, strength, power, or even size. The story behind of the Four Harmonious Friends can be traced back to Lord Buddha's previous lives and also appears in Lord Buddha's teachings. Hanging this design in your home is believed to bring in harmony, friendship, peace and cooperation from all. Set includes 10 flags that measure approximately 12 by 9 inches. Entire strand is about 10 feet long. Made of hemmed cotton in Nepal. The Four Harmonious Friends flag arrived as described and looks to be great quality. 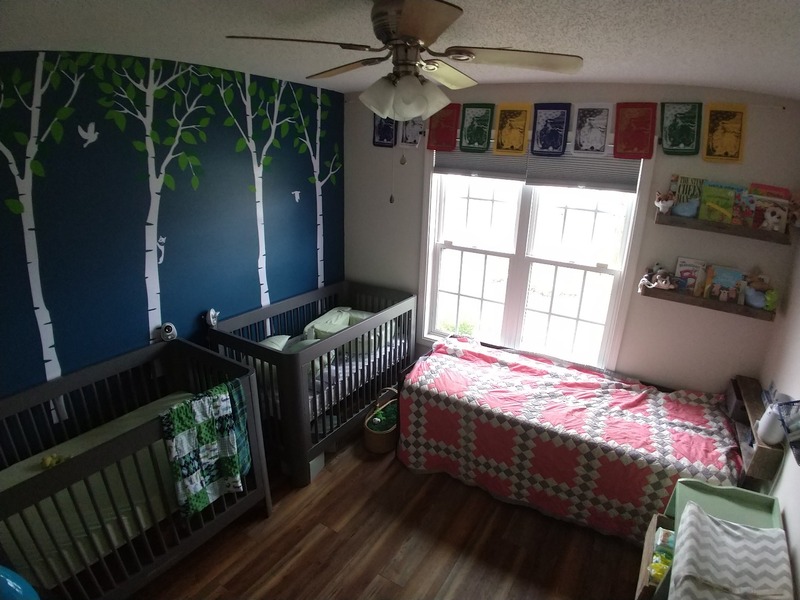 We hung it in our twins nursery to add some color and story telling once they are old enough. The flag was shipped quickly and arrived on time. Hello Brandon, thank you for sharing these photos! 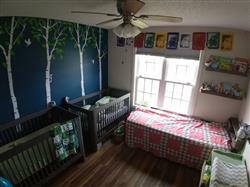 The Four Harmonious Friends Flags look lovely in the nursery! 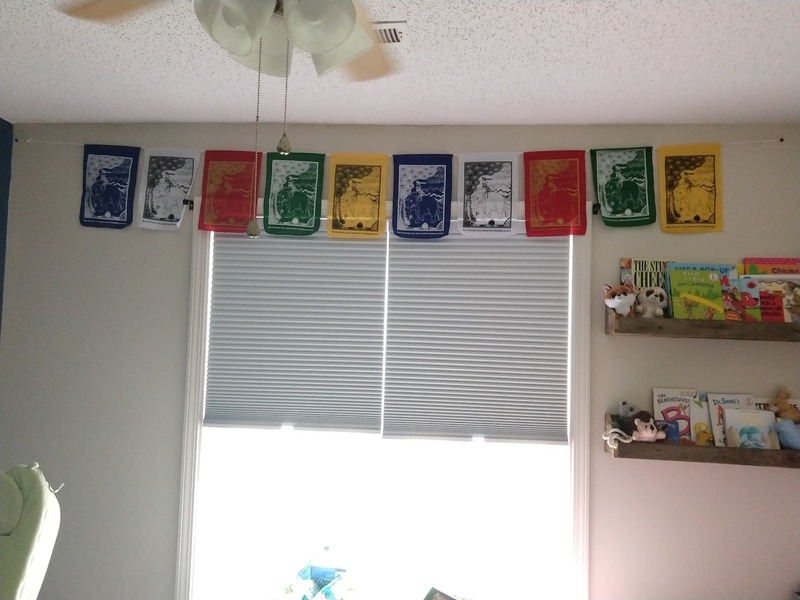 I love these prayer flags! 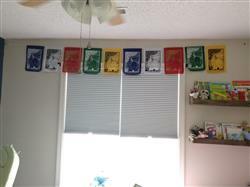 I have them hanging in my yoga studio! Very pretty and sturdy too. These are great flags. They survived a full year of a hot Texas summer and all of the wind we have here. I like the prayers in English. My grandkids each has their own "saying". They are boys and don't discuss Prayers but they do discuss sayings. I have a friend who has cancer, and I got these as a gift for her. The power of positive thinking and good karma I hope will help her find peace. The flags are so beautiful, and have such a good message, that I ordered a 2nd set...they now frame the back of my garden... so beautiful, peaceful, and I love that there is good energy going into the universe.